"This is the first time after the Revolution we see a lady behind the president"
TEHRAN, Iran (CNN) -- Dancing in public is not allowed in Iran, but thousands could hardly contain themselves at a recent presidential campaign rally in the capital city, Tehran. 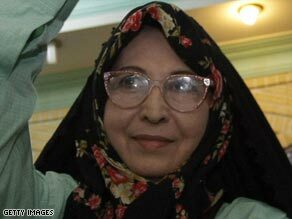 Supporters hope Zahra Rahnavard will become Iran's future first lady. On this day, the deafening cheers were not for presidential hopeful Mir Hossein Mousavi, but rather for his wife -- a woman some are calling Iran's Michelle Obama. The comparisons to the first lady of the United States stem from the role Zahra Rahnavard is playing in her husband's quest for the presidency. Never in the history of Iranian presidential elections has a candidate put his wife in the forefront of his campaign. "We look at her and we say, 'we want to be like her in the future, ' " said Shakiba Shakerhosseie, one of 12,000 people who packed into Tehran's indoor Azadi (Freedom) sports stadium to hear Rahnavard speak. Iran became an Islamic republic in 1979 after the ruling monarchy was overthrown and Shah Mohammad Reza Pahlavi was forced into exile. The revolution also ended the ceremonial role of first lady that the last queen, Farah, enjoyed. At this rally, Rahnavard -- a writer and art professor -- spoke for her husband, who was campaigning elsewhere. Wearing a floral headscarf and a traditional black chador -- a full-length loose robe that women in Iran wear like a cloak -- Rahnavard called for freedoms she says were lost during President Mahmoud Ahmadijenad's term. "I hope freedom of speech, freedom of the pen and freedom of thought will not be forgotten," she said. The crowd, which was clad in Mousavi's trademark color green, cheered wildly. It waved placards with his picture and swayed from side to side, chanting and beating drums. The women sat on one side; the men on the other. The overwhelming majority were young voters, many of whom said they attended because of Mousavi's wife, a mother of three. Iran's population -- estimated at more than 66 million -- has a median age of 27. "I am really angry here in Iran with the position of women," said Saghar Kouhestani, adding that she supports Mousavi because of his wife. Mousavi, a former prime minister, is considered a threat to Ahmadinejad, a hard-liner, in the June 12 elections. He is credited for successfully navigating the Iranian economy during a bloody eight-year war with Iraq in the 1980s. Over the weekend, the Iranian government blocked access to the social networking site Facebook, where Mousavi has a page with more than 5,000 supporters, the semi-official Iranian Labor News Agency (ILNA) said. Those attempting to visit Facebook received a message in Farsi saying, "Access to this site is not possible." Political science professor Mohammad Marandi downplays Rahnavard's impact. She may win over reformists and women, he says, but what will win the election is a solution to the floundering economy and a strong performance in the debates. "If Ahmadinejad does well in the debates, I don't think anyone will be able to defeat him," Marandi said. But try selling that to Rahnavard's enthusiastic supporters. "This is the first time after the Revolution we see a lady behind the president," said Farhad Mahmoudi. "And this is why we're so happy because we can have a first lady."